Heat oven to 350°F. Lightly grease cookie sheet. Separate dough into 5 rolls. To make mini king cake, unroll 1 roll into a dough rope; fold rope in half lengthwise. Twist dough in a spiral, and shape into a circle. Place on cookie sheet. Repeat to use up rolls, placing 2 inches apart. Spread icing on warm cakes. Sprinkle with colored sugars. To make homemade colored sugar, add sugar and a drop of food color to a small food-storage plastic bag. Knead sugar with fingers on the outside of the bag until the color distributes evenly. Add additional food color to desired color. 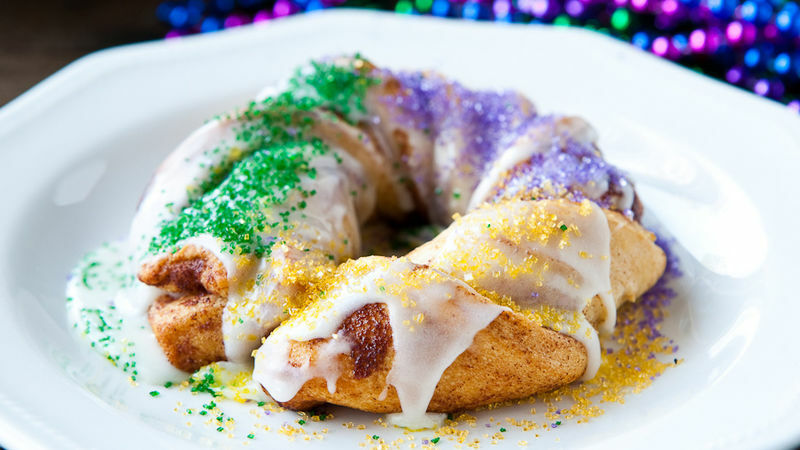 To get sugar to stick to the icing, sprinkle the sugar on immediately after spreading icing on the mini king cakes.